Mr. Morency is Schneider Electric’s VP of Small Building Systems, where he oversees the organization’s mission of bringing innovative control solutions to small- and medium-sized buildings, contributing to a greener and more efficient world. He is a member of the Ordre des Ingénieurs du Québec, and holds a Bachelor of Science degree in Electrical Engineering from Laval University in Quebec City, specializing in electromechanical and power distribution. Conventional wisdom is that wireless is limited and can’t handle large spaces, but that just isn’t true anymore. 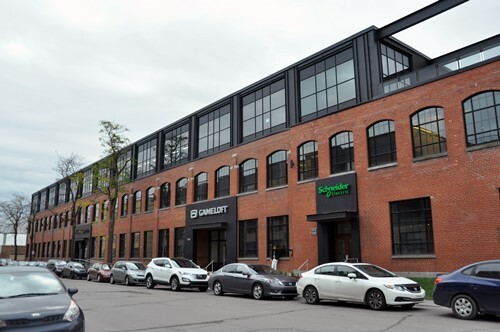 Schneider Electric’s Small Building Systems Research & Development operations have moved to a renovated office space at 7262 Rue Marconi in Montreal. Formerly a textile mill, the top floor of the building has been rebuilt and retrofitted with advanced energy-efficient systems and technology and is now a showcase for renewable systems and green building automation. We interviewed the Vice President of the Small Building Systems group, Frederick Morency, to find out more about the project and how it was accomplished. Sinclair: Can you describe the office space in Montreal and what makes it special? Morency: I would say two things stand out about this building. First, it’s a renovation project within a historic building. The developer we worked with, Group Montoni, has a track record of bringing old buildings back to life, and we at Schneider Electric™ are focused on that as well with our building automation systems—especially our wireless controllers and other products, which make a renovation much easier to implement. And the second point is the degree to which the space has been updated. As an R&D group, we wanted the latest and greatest for ourselves, to show that we can use our own products to create a highly advanced office space, and that’s what we have accomplished here. We have energy harvesting, LED lighting, on-demand ventilation, and many other cutting edge systems. All of these systems are linked to our StruxureWare® Building Expert software which provides real-time web-based monitoring and control of everything in the building, at all times. The office space is really state-of-the-art in all respects. That’s important because this facility is the home of our test and validation operations, and we want to make a statement to our customers and the marketplace that we bring reliable and innovative products to market, with the expected level of performance. On top of that, we are not just implementing our solutions, we are living with them ourselves, and that helps our engineers have the same experience as our customers. We like to say we are drinking our own champagne, if you will. Sinclair: It’s a large space. Isn’t that difficult to handle with wireless technology? Morency: Conventional wisdom is that wireless is limited and can’t handle large spaces, but that just isn’t true anymore. The way we deploy our wireless controllers, using ZigBee® mesh networks and MPM gateways that can be up to 30 meters or more from the controllers they serve, means there are very few spaces that can’t be outfitted with wireless. Frankly, that’s one of the reasons we wanted to use our products on this project, to prove how far wireless building automation can be taken nowadays. Sinclair: How did the project come about? Why not just build a new space? Morency: Well, first of all, we needed a new space, whether old or new. Schneider Electric’s Small Building Systems group has been experiencing tremendous momentum and success, and we had outgrown our previous facility. So we wanted to bring everyone together into a modern and more efficient new space that showcased our products. As it turned out, Group Montoni was planning the renovation of 7262 Rue Marconi, and we saw it as an opportunity to do something really special. No one is surprised when a new construction comes along with the latest renewable technologies and innovations, but an existing office space—especially in an old structure—is another story. We saw this as a challenge we just couldn’t resist. We wanted to prove that you can take an existing structure and bring it up to LEEDs standards. And in fact Group Montoni has applied for LEEDs certification, and although we don’t have that formal recognition yet, we hope to have it soon. Another reason for selecting this specific location was the nearby public transportation, which we think is very important. As a company, we subsidize our employee’s monthly passes. We don’t just talk about a green and sustainable future, we like to walk the walk. Sinclair: What stands out most in your mind about the office space, now that it’s completed? Morency: I would say it’s not any one thing, but the overall breadth of what was done. I mentioned some of the innovations earlier, but let me go into a little more detail. One example is the lighting: we used LED lighting provided by Lucibel, a Schneider Electric partner, instead of traditional neon, because LED uses about 10 times less energy in practice. This is partly because LED is inherently more energy efficient, and partly because unlike neon, it can be dimmed or brightened to any level needed. So our lighting controls have integrated sensors that adjust the LED lights based on the natural light available, maintaining a consistent level and never generating more light than is needed. Of course, we also have occupancy sensors so the lighting knows when to turn off altogether. The lighting is controlled with EnOcean® sensors linked to the ZigBee network, through our MPM units. Another example is on-demand ventilation. The traditional way to meet ventilation standards is to constantly circulate new air through the building, but this means fans are running all the time and, in addition, the air has to be heated or cooled depending on outside temperatures. A lot of energy gets wasted that way. So we installed CO2 sensors linked to the ventilation system, and outside air is brought in only when needed, which reduces the energy load and still maintains a healthy, optimum environment. We also integrated power metering into our system, again through our MPM units, which gives us a truly holistic view of our energy use that includes all the power loads, including main power as well as HVAC and lighting. Then finally, the StruxureWare Building Expert software brings all this together, so we can monitor everything that’s happening, generate reports, analyze long-term trends, and generally just manage the energy use to a degree that would have been impossible in a building like this just a few years ago. Sinclair: What results have you seen, and what plans do you have for the future? Morency: We’ve definitely seen an impact on team synergies and an increase in development velocity. As R&D specialists, our team is rightly proud to work in such an advanced and exciting office space. As for the future, we developed our new space to serve our growth strategy, to take building automation all the way from the room to the cloud. We see this capability as a game-changer in BMS, and this space is the proof. We have room to expand in our new location so thereare really no boundaries to our continued growth. Not only do we have a great place to work, but we can use it as a showcase and to test our innovations and new products. I fully expect to see great things coming out of this investment for a long time to come. Small Building System New Offices in Montreal - Building Automation System Overview. Watch this video to learn more about the innovation and solutions in this building.